8-bit cookies - who wants to beta test? 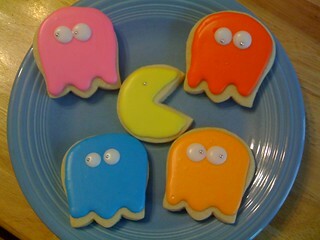 Here's my first attempt at making Pacman cookies. For ghosts - I used a tulip cookie cutter - I just cut off the stem part. I used Wilton gel colors for frosting - lemon yellow, christmas red, royal blue, rose, and orange. I used silver dragees for the eyes. * Mix flour, salt and baking powder in one mixing bowl and put aside. * Mix butter with the sugar in another mixing bowl. Then mix in egg and vanilla until everything is thoroughly mixed. * Slowly mix in the flour mixture into the butter/sugar/egg mixture. *Wrap the dough in cling wrap and put it in the freezer for an half hour or so. Bake the cookies the same day you make the dough or else the dough gets dried out and it is difficult to roll out if you are cutting out shapes. You want the dough chilled so the cookies retain their shapes. * Roll the cookies out to about 1/3 inch. Make sure you don’t overly flour the dough as you are rolling it out, or it becomes more difficult to reroll again. * The recipe says the cookies should be in the oven for 10 minutes (on an ungreased baking pan - I use a silpat), but make sure you start checking on the cookies about 6-7 minutes in. You know the cookies are ready if you start seeing the bottom edges of the cookies start to slightly turn a light tan (if it is darker than a light tan, they are burning). * Move the freshly baked cookies off of the baking pan as soon as it comes out of the oven, or else it will stick to the pan (unless you're using a silpat). * Use an electric mixer and mix powdered sugar, meringue powder and warm water together. Make sure you don’t over mix…you don’t want the icing to be “whipped.” Mixing it for about 1 minute is perfect. * Check the consistency. Use a spoon and lift a spoonful of icing and let the icing drip into the bowl. If it is running off of the spoon quickly, you need to add a little more powdered sugar and mix. If it is not dripping off of the spoon (as in it is pausing as it is going off of the spoon) start adding a little more water (a tablespoon at a time) and mix. Ideally, the icing should be dripping off of the spoon at a very slow, steady rate. * When you think you have a good consistency, add the dye and mix for another 20 seconds. * Take the plastic ketchup bottle and cut the very edge of the tip off (so that you have about ¼ inch diameter of an opening on the tip). Open the bottle and start spooning the icing into the bottle. (You might not want to fill the bottle in case you discover the icing is not the correct consistency.) Make sure that you put a damp paper towel over the remaining icing in the mixing bowl, or else it will dry up. * Take a cookie and squeeze the icing bottle and trace around the perimeter of the cookie. If the icing is oozing off of the cookie, it means that you have too much water in the icing. You will need to dump the icing back into the mixing bowl and add more powdered sugar. * After you have outlined the perimeter of the cookie, go back and “flood” in the rest of the cookie. If you are finding that the icing isn’t really flooding around the perimeter well (even when you try to help it along), it means you have too much baking powder. You need to dump the icing back into the mixing bowl and add a little more water. * When you have the cookie fully iced, add sprinkles or any other decoration. * After you have iced the cookies, you need to lay the cookies out overnight to dry. You can lightly lay wax paper or paper towel over the cookies as long as the top layers of the frosting is relatively dry. If you completely cover the cookies so that they don’t have access to air, the frosting won’t dry and the frosting tends to “wrinkle,” thus, ruining the cookies. In the morning, the cookie icing should have dried on the cookie and should be shiny and pretty.